Bork, bork, bork! The Blot was thrilled to learn that Diamond Select Toys is continuing its fantastic line of The Muppets Select Action Figures with a new Swedish Chef deluxe figure set. 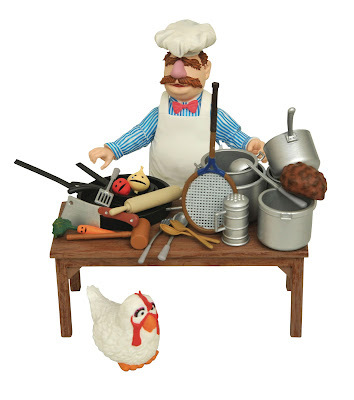 This beloved Muppet chef comes with a massive number of accessories, including a table, pans, pots, food (talking and non-talking) and even a chicken, to make Chicken in the Basket. The Muppets Swedish Chef Deluxe Select Action Figure is in scale with other DST Select action figures, and stands around 6” tall, and comes packaged in display ready Select action figure packaging, with side panel artwork for shelf reference. Collectors can pre-order this awesome new figure at Entertainment Earth now for $22.99 here.